As we begin to flesh out the visual locations in the town, we need to design each store front, other buildings and the exterior features of the town. Additionally, the architectural styles need to be consistent to one another while conveying an iconic representation players can easily relate to. I start out with a building's basic shape - and research a number of images in a particular style on line - in this case stereotypical small town American businesses. I'll start roughing out a basic building shape in blue pencil and felt pen. Then render more shading based on it's construction materials, is it made of wood, brick, glass? How many windows? What's the aesthetic? What's the function? Once I have an image that evokes the feel, I'll go back in and add the appropriate window dressing , signage and other details. Finally I'll go back in and add more appropriate typography, logos and associated sight gags when I execute a more final digital render. We're still early in the design process, so we don't know if all these will make it into the final game, but it helps spur ideas. Interesting! I'd like to know what approach are you following about resolution for backgrounds. Since the game will also run on mobile, how do you choose the "right" resolution since the game will be played with different aspect ratio and at different resolutions? Will you let the images stretch or will you leave the borders as "no interaction zones" during the design of the game? Any other consideration would be very appreciated. It's being designed for 16:9 (most common PC ratio), but will adjust to 4:3 for iPad. Other ratios might get slight letter boxing where needed. Since most of the rooms will scroll, we can have a little bit of extra room displayed. This is all voodoo, so we won't know for sure until we do it. The goal is to fill the screen with interesting data. As for resolution, all the art is being done at old commodore/PC resolution, so it's just scaled up. Scaling is easy, it's the aspect ratio that is a pain. Looking forward to see the voodoo happen. Was The Secret of Monkey Island developed at 256 colors, and then the palette reduced to 16 colors for the EGA version, or did a team go in and paint over the background art and sprites to update it? I always considered the Commodore 64 version of Maniac Mansion to be the official platform and game. If that's true, then what is the definitive version of SoMI? 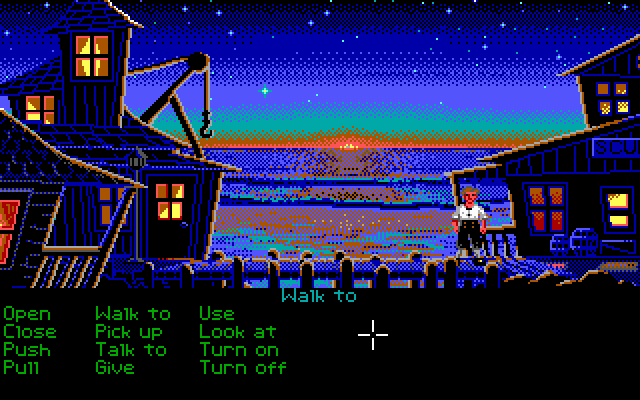 Monkey Island 1 was originally done in 16 color EGA (with text inventory). It was updated to 256 colors after Monkey Island 2 came out and there were various tweaks for Amiga, etc. I've kind of lost track of them all at this point. Then there are the Special Editions, which are a whole other thing. Nice to know. I've always wondered which version you had on your monitor during development. The information I found was unclear. I figured it wouldn't be a stretch if LucasArts had computers capable of 256 colors, and downgraded the game to 16 colors for consumers like they did with Hercules and CGA. When I close my eyes and imagine that game, I always see this sunset: http://i.imgur.com/DeN5Kni.png It was removed in the VGA version. If they ever make a National Game Registry, I hope the EGA version of the game gets archived. Well, of all of them, but definitely that one. When we were making MI 1, VGA wasn't popular enough and we wanted the game to look as good as it could for the majority of the players. Downgrading to CGA was OK because very few people had it. I don't know how true it is, being related after all these years, but it seems he played a crucial part in their graphical style. Perhaps without him the games would have looked like the original version of Maniac Mansion? I hope you guys get to do another game with Mark Ferrari. Particular since seeing his art demoed in the HTML5 colour cycling examples. I find the hardware store quite evoking (i don't no why but it reminds me of the 20th century New York. And now a completely different question: how much is the game supposed to last? I hope there's a bell to ring in the hardware store. haha. I used to mess with that old coot for hours. 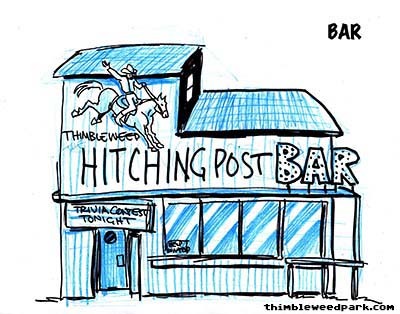 I find Hitching Post Bar looks like to modern. I prefer older style. Awesome concepts there, I really dig the classic nods to the architecture and signage typography; very interested in how it translates to the graphic style. I agree. One-hundred percent necessity understood on the hamster aspect. Signage requested. Trivia contest, eh? If there is such a feature in TP, please don't make the questions about completely obscure things that are impossible to figure out without looking them up on Google. Hugo's House of Horrors left me permanently scarred trying to get past that game's completely random trivia section right before the end. Being a kid back in 1990 and not even having ever heard of "the internet", yeah I never did finish that game until like 20 years later lol. I hate to ask this on a post that has nothing to do with it, but as I saw someone discussing resolution, I figured I'd ask and see what I got. I am wondering (since the game will be coming to iOS and Android) if there would be any possibility of bringing the game to Vita. I think it would not only serve to further the Indie community on the PlayStation platform, but also shed light on a genre that hasn't seen a ton of it in some time. You will obviously have to examine the demographic and determine if it would be lucrative or not, but I can assure that you would sell at least one copy (to myself), and I myself prefer the PlayStation medium to the Android alternative of my phone. We'd love to put Thimbleweed Park on the Vita (and PS4 and XBox), but those platforms require a bunch of console manufacture hoop jumping that we'll do later on, but right now we want to focus on delivering the promised Kickstarter builds. We're just two guys. Yeah, I completely understand. Sometimes those platforms can e very hard to work with, and the work you've done already is insane. I appreciate the response! Love the work you do and can't wait for the release, no matter what platforms it is on! No. You are two GENIUSES, inmy humble opinion! You have the spirit, the ideas, the ... "force", yeah, the force to make something wonderful from scratch. You two can do everything! Looks great. 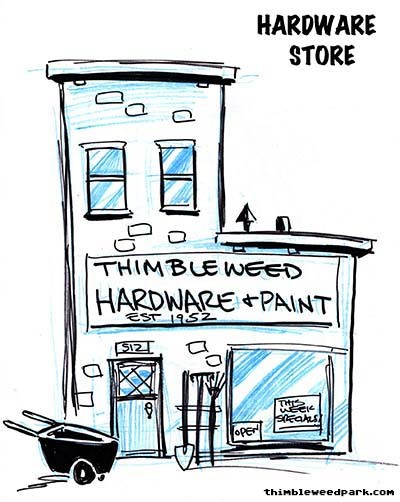 Just one question , has every store in Thimbleweed the location "Thimbleweed" in its name/sign? I usually expect this only in highly touristic active places but so far I didn't get the impression that Thimbleweed is such a public magnet. Or am I wrong here and you have a different impression of the city in mind than I have so far. I have the exact opposite perception. Every small town has businesses with the town name in the title. 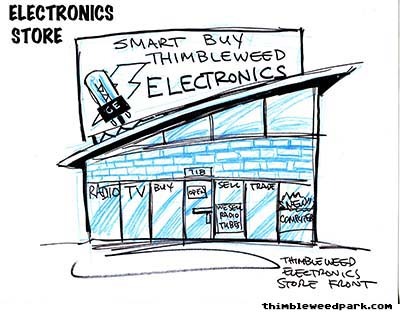 Thimbleweed Bank, Thimbleweed Hairdressing and Salmon, etc. Steve Kirk will compose the music for Thimbleweed Park. He did the music in the trailer, and also did music for Scurvy Scallawags and Voodoo Vince. Well I'll be the son of a motherless goat! I must have been hiding in a deep dark hole for the last few months as I've just found out about Thimbleweed Park and I am experiencing Episode VII/Twin Peaks season 3 levels of excitement for this new, classic, point and click romp from Ron and Gary who arguably defined the genre! It is fantastic to read this blog which shows just how much care and attention is being poured into this project - reducing the speed at which characters move from foreground to background, for instance, to make it 'feel' like those iconic games deleloped over twenty years ago - just goes to show how much a labour of love this is for you guys. I applaud your efforts and eagerly look forward to reading about the continuing development and, of course, getting my sweaty mitts on the finished product in 2016. You know you can still support the developers where it says "Support Us" and pre-order a copy, right? I did not realise this Mr Curtain. Thank you for pointing that out. I'll head over now and get some supporting done. 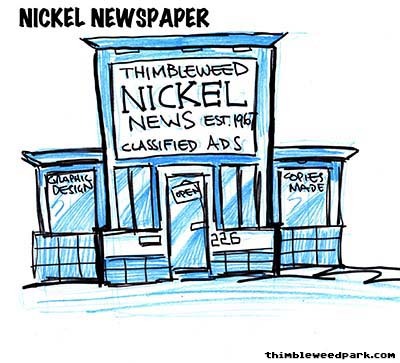 I enjoy following this blog so much that I chose to support Thimbleweed Park as well! Had to fire up MI 1 + 2 again as well, but I never got the chance to play Maniac Mansion back in the days. Anyone know if it's possible to purchase a copy? The link above is perfect for browsing active kickstarter video game projects. It lists projects in order from those ending soonest to those newly created (I think every project runs for 30 days) and also displays current funding, what the initial funding goal is, etc. etc. I've missed out on plenty of great kickstarter video game campaigns in the past that I wish I had backed (Shovel Knight!) simply because I didn't know about them, so I now browse kicktraq on a nearly daily basis keeping an eye on the more promising-looking projects. As for Thimbleweed Park, while the kickstarter campaign is over, as mentioned you can still click the "support us" tab on this site, help fund development of the game and get a digital copy. I wish there was an edit button instead of having to create a new post, but speaking of active kickstarter campaigns there's a point and click adventure/2D space shooter game (yes you read that right) called Starr Mazer that ends in just over a week that looks really good and is like a combination of Space Ace, R-Type, Maniac Mansion and Day of the Tentacle. Some of my friends in the chiptune scene are doing the OST, and I'd really appreciate it if you would help fund this project! I haven't pledged just yet (i know i know) but I'm absolutely going to be pledging $80 shortly for the physical boxed copy of Starr Mazer after discovering on another part of the page that the $80 Tier will be a physical box + physical instruction manual + physical copy of the game via a customized TG-16 looking flash drive (which is only mentioned on a separate backer rewards part of the project page, why didn't they mention this in the Tier description? they would have so many backers upgrade to this Tier!) and that this is all kickstarter exclusive. I'm a fanatic of the R-Type and Gradius games so I was instantly lured into checking out the game and much to my surprise it turns out to also be a point and click adventure puzzle game heavily inspired by Ron and Gary's LucasArts classics! It's the best of both worlds imo lol. Gary, about the design. Will the building exteriors be funny looking like in Monkey Island, or will they be more traditional like in Maniac Mansion? By the way, I made this free (GPL) cartoon font once upon a time. Please feel free to use it in the store logos, signs or anywhere else.